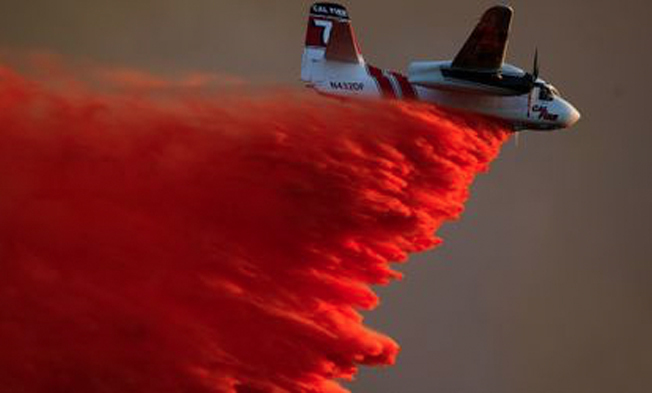 2018 Cal Fire S-2 Dumping Flame Retardant and still racked up historical loss. For residents living in wildfire country, the sight of airplanes spewing clouds of pink retardant and helicopters dumping torrents of water onto flames can bring hope and reassurance — regardless of their usefulness in fighting a fire. Similarly, the absence of aircraft from a wildfire will quickly inspire public criticism and outrage. Counting on planes to get up and down and refilled is not logical and only making the owners of all the leased air craft rich. We can not spray fire breaks months ahead of wild fire season with ground vehicles and small crop dusters that deliver accurate fire breaks. Over 20 Fire Chiefs and 50 Fire Fighters has witnessed this new American Clean Fire Inhibitor In Action but all say good luck when you get upstairs. This Mighty Fire Breaker Chemistry is UL GreenGuard Gold certified and Cal Fire listed as a fire retardant that it’s not because it’s an inhibitor that breaks the free radical chain in fire. M Fire is asking a retired fire chief and local California Congressman to ask Cal Fire to schedule a Black Line Wild Fire Demo Burn to prove how M-Fires Mighty FireBreaker will prove to out perform all the shovels, racks, bulldozers and the fire retardant they are currently using in front of news cameras. M-Fire chemistry is blended in LA and may be the answer if brave firefighters add a proactive chemistry fire break instead of trying to dig them in they could spray breaks. If this product and proactive plan was in place last year as we watched the fire burning west to eventually jump the 101 freeway we would have saved Malibu from loss. We are confident in making that claim because our fire inhibitor sprays on dry vegetation fuel out in front of fires and dry to the bone we stop all fires in there tracts the minute they show up. We understand the big firefighter politics and that is why we want this demo covered by news media teams. Let’s have California residents decide if this new Clean Fire chemistry should be added to what Cal Fire does to save homes from wild fires. The drop wet fire retardant clay over Fire where we drop no where near Fire we are out in front saving homes. There red clay can be nowhere near homes it’s creates a radical mess. Our chemical gets sprayed around homes and dry hillsides and even weeks after it will stop a Fires ability to advance. We just need a side by side live media covered demo Phos-chek verses Mighty Fire Breaker.